Loveable loser Ashley "Ash" Williams is just looking for his piece of the pie. After spending the last 30 years whittling away a meager existence as a stock clerk at a Michigan big box store, he's met with his fate as "El Jeffe." That fate makes him the only man who can stand against the forces of the evil Deadites and the woman, Ruby, a.k.a. "The Dark One," who wants to rule them all under the pretense of bringing order to their natural state of chaos – you know, like The Godfather. It's a classic scenario of an unlikely hero facing off against seemingly insurmountable odds so, naturally, a show like Ash vs. Evil Dead would have its hero make a deal with a (possibly the) devil in exchange for a new beginning in Jacksonville and a little gas money. And, naturally, that deal appears to bring about a potential end-of-the-world scenario as Ash and his traveling companions make their way to the sunshine state. That scenario, with its ominous tones and sink holes opening up everywhere just as Ash finally negotiated a settlement he could not only live with but, in his foolish little mind, be made happy by, pretty much sums up where the series' strengths lie. Despite its flaws, season 1 of Ash vs. Evil Dead managed to consistently hit one nail squarely on the head throughout its initial 10-episode run: It was able to frame its story around the conflict that is Ash's complete inability to be the hero and his supposed destiny as the hero. It's not that radical an idea; it's just executed differently. The world is full of stories about reluctant heroes, but rarely does it shine a light on those who make the tough decision in the hopes it allows them to remain blissfully unenlightened. Usually, the hero is forced into making a fateful choice out of a sense of righteousness. Here, the hero is just aiming for what he wants and reaches for it from of a sense of righteous ignorance. Ash isn't your typical moral-compass-guided hero, nor is he a rogue or plucky brigand; he's kind of a moron who sees his life as a missed opportunity that no amount of demon slaying is going to fix. So when he is forced into an impossible situation where he could do away with the The Dark One, but at the cost of Pablo and Kelly's lives, he chooses life, "a normal life," their lives… and a life in Jacksonville. And in the process, he unleashes hell and opens up a whole boatload of storytelling possibilities for the series' second season. But 'The Dark One' isn't just about ramping up for season 2; it's also concerned with making sure the inaugural season of Ash vs. Evil Dead goes out with one hell of a stylistic bang. Penned by showrunner Craig DiGregorio, the finale goes out of its way to match the distinct visual style of the series' progenitor, Sam Raimi – paying homage and hitting the right nostalgic notes rather than straight aping of his filmic techniques. In roughly 35 minutes, the episode manage to capture the essence of Evil Dead with a madcap, blood-soaked nightmare that expertly balances comedy with tension and some truly horrific set pieces, lest the audience think the stakes are no longer high, now that Ash has a brood to protect. And that's where the series moves beyond simply emulating the movements of what came before it and tries something new: positioning Ash as something more than just the El Jeffe, the "alone wolf" out to stop a few Deadites who make the mistake of crossing his path. Ash has Pablo and Kelly to look out for now. And while their presence essentially forces Ash's hand – the regular one, not the chainsaw one – into making a horrible mistake out of misguided trust of an evil creature and his own benevolence, that act works to underline the character's arc throughout this first season. In between the series swinging its narrative chainsaw and blasting plot points like they were creepy, eyeless demonic children barfed up by a possessed Pablo, Ash vs. Evil Dead established the importance of its supporting cast and moved its protagonist into a role as an unlikely momma bear who is fiercely protective, though without necessarily grasping why. But that's in keeping with the character. Ash has largely been getting by in his dealings with the Deadites on sheer instinct. He doesn't pause to think; he just acts, and that when he does the greatest good – whatever that is in the world of Evil Dead. It's when he's given time to rationalize a decision that he ends up choosing Jacksonville and his two companions over the rest of the world. And that choice makes all the difference. Season 1 has been all over the place, at times plagued with pacing issues, as though it was uncertain it knew where it wanted to go. Or, more likely, it knew where things would eventually circle back around to that cabin in the woods and its surprisingly spacious cellar, making the unknown element the gap in between. The season could have benefitted from fewer episodes, but that doesn't really change how gloriously on point 'The Dark One' manages to be. The finale is as tuned into its comedic timing and its unrelenting display of horror as the series premiere. In some ways, it actually takes things up a notch, as the mercilessness with which Heather (Samara Weaving) is treated in her final moments suggests a level of cruelty the show hasn't really displayed before. After breaking her leg, the aspiring dental hygienist gets the full treatment: bounced around the cabin like a rag doll, body slammed by an overly aggressive piece of vintage furniture, punctured by rusty nails, and finally pulled into a thematically lit room before being spat out in pieces, surfing a tidal wave of blood. Heather's fate is an escalation, a hint of what's to come it seems. As Pablo says to Ash as he's contemplating the sandy-beached life full of smiling girls in bikinis he'd always dreamed of, "You have no idea what's out there." It works in conjunction with Heather meeting a particularly gruesome and unforgiving end. Ash can try and remain blinkered to hell he's helped unleash, and to convince himself the good times are right around the corner, but the two voices in the backseat of his Oldsmobile won't be drowned out by the dulcet tones of AC/DC forever. Things are about to get a whole lot worse for everyone, Ash, Pablo, and Kelly included. But the worse things get for them, the better it will be for all of us watching. Ash vs. 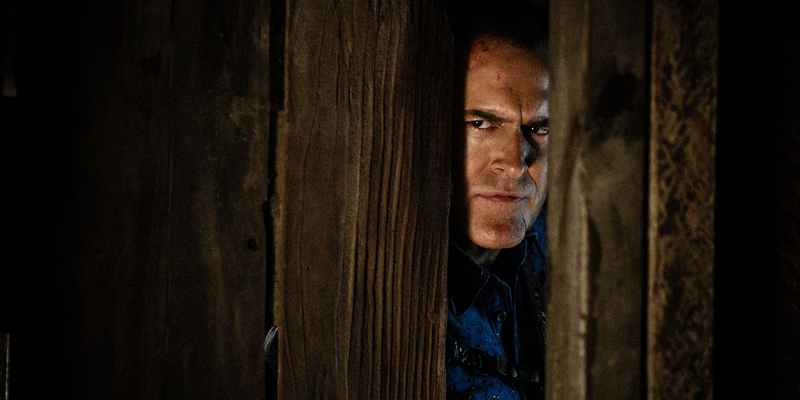 Evil Dead will return in 2016 on Starz.